Aurora Spa – a very special treat! Can you believe how the year has flown? It was Christmas last year that my hubby bought me a gift voucher to Aurora Spa. In fear of it expiring soon, I only just managed to get there to redeem it eleven months later! Just goes to show that with busy schedules it is really hard sometimes to take that greatly needed time out for ourselves to unwind and relax. With the completion of the physical demands of the KX Yoga 21 Day Challenge, it was the perfect time for me to treat my body to a Relax 2 hour Retreat. My first treatment was the Active Botanical Facial. This was absolutely amazing! There was cleansing, toning, exfoliating…but I was just in heaven with the soothing massaging along the way. During the hour, I fell into a deep world of relaxation whilst still aware and able to appreciate the treatment. In between applications, I was also treated to both feet and hand massages. Very nice! This was an hour of bliss in terms of relaxation and massage, and my skin was totally hydrated, plump and glowing after the treatment. I would have to rate this as the highlight of my spa experience! Whilst there are various massages on offer, I chose the deep tissue massage as I was a little stiff and sore in places from the intense yoga sessions over the previous three weeks. The masseuse asked me at the start what sort of pressure I would like. I expressed firm, and firm it was! I definitely felt better after the massage as she worked into the tense areas with vigour to loosen and relieve tightness. In hindsight though, I probably should have left this sort of massage for another time, as coming from a complete world of calm and relaxation after the facial, I was thrust into a world of “good” pain as my tight muscles needed releasing. If I had the opportunity to do this again, I would request the massage first then finish the retreat with the relaxing facial. I have been a long time visitor to Aurora Spa as I have found it to be the perfect place to relax and unwind. As soon as you walk in, the ambience of the styling, beautiful smells and professional and welcoming staff all work to set the luxurious scene. Cost – Cost of the treatments is at the more expensive end however this spa offers a high-quality experience. There are discounts for weekday treatments so look out for them on their website. Parking – For a 2-hour retreat, you are likely to spend an extra 30-45 minutes at the spa. You need to be there around 15 minutes earlier and may want to linger a little longer at the end in the lounge with a cup of tea. Unfortunately, there is no discounted parking at the Prince Hotel (the building in which Aurora Spa is located). So you need to add an extra $24 to your total cost for 3 hours of parking. If you only have a one-hour treatment, there is 2-hour free parking nearby on the street. (Since publishing this post, there is now FREE council parking available on the corner of Loch Street and Jackson Street). 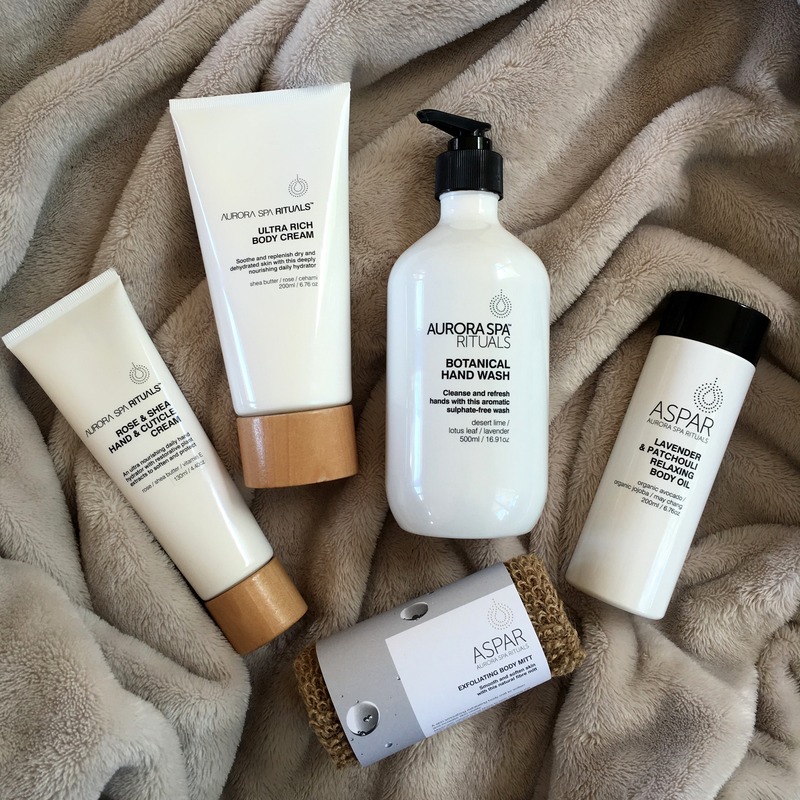 I have been a long time fan of the Aurora Spa Ritual Aspar products. My favourite scent is Lavender & Patchouli, which comes in the Relaxing Body Oil and the scented candle. The desert lime, lotus leaf, and lavender Botanical Hand Wash also adds a “touch of spa” to my bathrooms. Aurora is a luxurious spa which offers an indulgent treat. I feel very lucky to have been given a gift voucher for Christmas last year. I do know what a lovely experience it is and have also shared it with friends on previous occasions. Last year I also took my sister to Aurora for her birthday. It is a beautiful way to treat yourself and or others. ← Previous Previous post: The KX Yoga 21 day challenge completed! I’ve been treated to the Aurora Spa tooooo for my ‘milestone’ birthday! Best facial I’ve ever had! I know right! The facials are amazing!